With all the heated rhetoric and division within fandom over “Star Trek: Discovery”, I wasn’t sure I wanted to weigh in. Plus, I’m sort of torn about it myself. But, ultimately, I thought I might find it cathartic to force myself to put my thoughts down. Besides, it’s just my opinion, and it isn’t worth any less than anyone else’s, so why not? SPOILER! SPOILER! SPOILER! SPOILER! SPOILER! SPOILER! SPOILER! SPOILER! SPOILER! I did an earlier review of the pilot episodes, essentially the prologue to the rest of the season. If you haven’t already read it, you might want to jump over and do that now, since this is sort of a “sequel” review, and there are a couple things addressed there that I won’t touch on here. I have to admit, they pulled off a couple of twists that I didn’t see coming. Take Captain Lorca, for instance. He definitely had an independent streak, and I wasn’t entirely surprised to see him dodge, if not outright disobey, his orders in order to carry out his agenda. I chalked this up to “realism” (in his mind, at least) and a bit more aggressive nature. But, of course, I had no idea what that agenda truly entailed until towards the end. I remember some fans commenting about him being mean, evil, even speculating that he was from the “Mirror” universe. Even after that scene when he held a phaser on Cornwell, I was more willing to give him the benefit of the doubt, since he was overstressed and suffering from a form of PTSD. (She still should have thrown him in the brig.) Maybe I’m obtuse, or maybe I just didn’t want to see it, but I didn’t. And they — i.e., those other viewers — were right. (I was suspicious re the eye-sensitivity thing, though.) Still, I’m a bit disappointed to see Mirror Lorca go, ‘cuz he was an interesting character. I was a little surprised that they went to the “Mirror” universe so soon, though. Were they — i.e., the writers/producers — so nervous about the show being able to establish itself on its own that they felt they needed to (re-)introduce a fan-favorite place/situation? Have to say, I enjoyed it, and it may indeed have helped. Also, bringing back Georgiou the way they did was very intriguing. I assume she will pop up on occasion in subsequent seasons, and I’m fine with that. On the other hand, the changes to the Terran Empire’s fashion choices was a bit irritating. I commented on the Klingon and Starfleet uniforms in my earlier review. Regarding Starfleet, this article made some valid points about changes in uniform styles both in previous ST series and in real life military, so I suppose it makes sense that even the vaunted Terran Empire can fall victim to fashion trends. Btw, my favorite Mirror version of the Discovery crew was young Captain “Killy”. I have to assume the real “Killy” is as deadly as she is ambitious, so she killed her way up the hierarchy very quickly. The TE uniform and straight blonde hair were quite flattering for “our” Cadet Tilly. I enjoy watching the brilliant-but-unsure “prime” Tilly — sweet girl — and appreciated seeing her grow a bit this season. The other twist that both amazed and frustrated me was the fact that Ash Tyler was, in fact, Klingon. Not only that, he was Voq, the albino follower of T’Kuvma seen back in the pilot 2-parter. Some fans predicted this, but I refused to accept it. And, in a sense, I still refuse. I don’t care how they explained it, it’s too far a stretch for me to believe that Klingons would be capable of this level of sophisticated surgery and genetic manipulation. (Actually, I don’t buy the entire procedure being possible for any race, but, hey, this is science fiction, after all.) The explanations by L’Rell and Dr. Culber seemed to conflict somewhat. 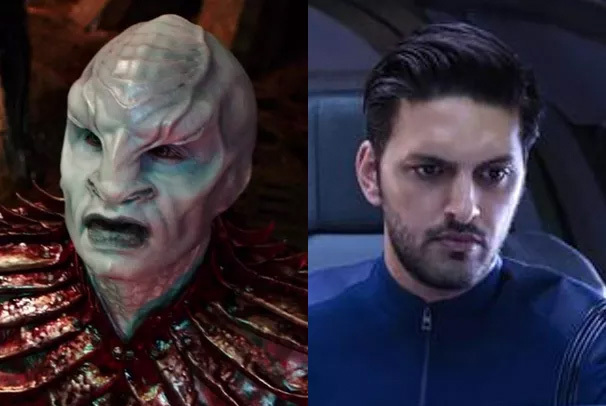 But, near as I can figure, L’Rell not only made Voq anatomically human (and a match for the captured Lt. Tyler) but somehow transformed his DNA, too. (That’s the kicker for me.) Then, she essentially copied Tyler’s consciousness and overlaid it onto Voq/new-Tyler’s mind, while programming the Voq personality to take control at the proper time. (Except, it didn’t quite go as planned.) This new body somehow showed no signs of the physical trauma of being remade, even at the genetic level? C’mon!! Frankly, it would have been more believable for L’Rell to have simply cloned Tyler and “inserted” a copy of Voq’s mind/memories to stay in the background and take control when required. Heck, if Voq was hellbent on punishing himself, he could’ve had his brain transplanted into a Tyler clone. That said, the Tyler/Voq character not only gave us an idea how fanatical his faction was, but it also had a lasting impact on Burnham and her own growth as a character. (Plus, although Tyler/Voq is no longer part of Starfleet, they left it open for him to appear in later episodes, which could prove interesting.) I was glad to see Burnham evolve as a character. How could she not from all that she experienced personally and professionally? We even got to see a little more emotion from her. (Not much, though. Not sure if that is due to the writing/character or the acting.) In the end, it appeared that she was able to forgive herself, or at least come to terms with what happened in the past, and accept reinstatement into Starfleet with rank returned. I didn’t like Stamets from the get-go. He was arrogant and abrasive. But,… as the season progressed, I became a bit more sympathetic to his situation — i.e., frustrations with his pet project and the fact it was co-opted by Starfleet. Stamets himself even seemed to soften just a bit through the various events, not least of which was the tragic loss of his partner, Dr. Culber. Hopefully, the character will continue to be more likable in the future. I also hope we get to spend more time with and learn more about Detmer, Airiam, Owosekun, Rees, and Bryce — i.e., the rest of Discovery‘s recurring bridge crew — next season. That would be in line with the way the show was advertised as not focusing on senior officers, after all. Of those major characters who were killed off (or, at least, one version of them was) in season 1, I am most disappointed about Rekha Sharma’s Commander Landry. Sharma has an impressive genre resume, including stints on “Smallville”, “Battlestar Galactica”, “V”, and “The 100”. I was looking forward to getting to know Discovery‘s small-but-dangerous (and somewhat abrasive) Security Chief, seeing what makes her tick, watching her interactions with the rest of the crew, etc. Alas, ’twas not to be. I have mixed feelings about Harry Mudd. I liked that we got to see him, but I’m not sure I care for this harder-edged, vengeful, even bloodthirsty version of him. Gotta love a good time-loop story, though. Of course, though I addressed them in my earlier review, I need to make a few additional comments about the primary canon issues…. The Klingons. What more can be said about the Disco-Klingons? There are elements of the old, familiar Klingons, but so much has changed. 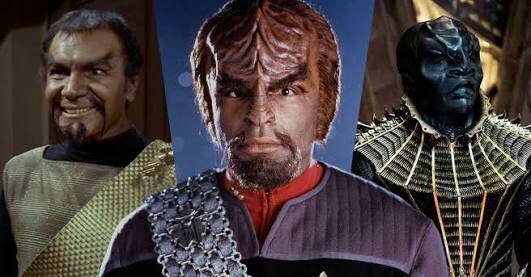 From their physical appearance to their fashion sense, these Klingons may as well be a whole new species. Some fans think people like me are complaining too much about this. They say, “Look at the previous changes in Klingon appearance. You accepted those!” Yes, but the distance (so to speak) between the Klingons that debuted in the original “Star Trek” and those that debuted in Star Trek III (1984) (and then used in subsequent TV series) was much shorter than between either of them and the Disco-Klingons. Plus, the prior changes have been explained satisfactorily (in DS9 and ENT, I believe), with the most human-looking version being a brief aberration, so it is series canon. And, while we must admit there are a few inconsistencies from previous series, it is best to stick to established canon whenever possible. I have played with a few ideas of how to get either of the earlier versions of the Klingons to replace the current Disco-Klingons. 1) Perhaps the Klingon houses we’ve seen represented are one Klingon race, while the STIII/TNG version make up the other houses. Wipe out the former, and the latter can take over. 2) Some sort of DNA-rewriting drug or disease could infect the Disco-Klingons, changing them all over a few years to the STIII/TNG version. 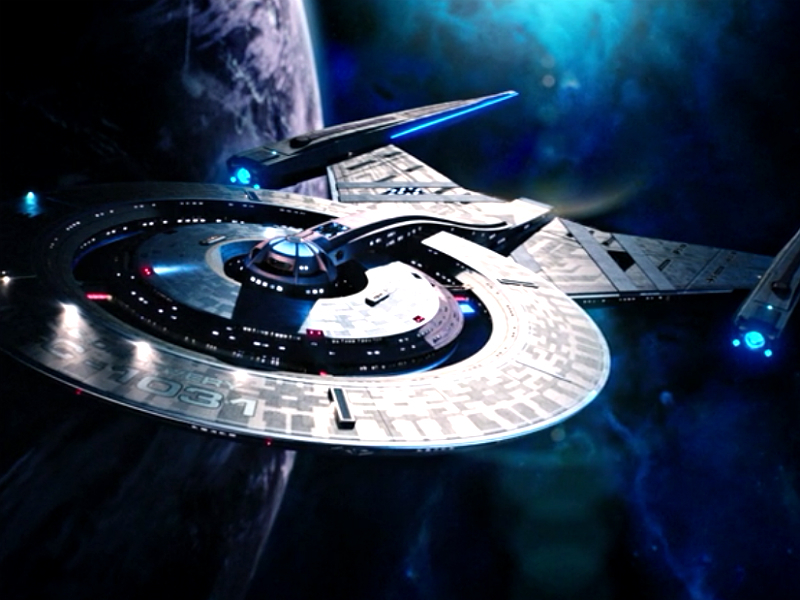 But, that wouldn’t explain why the one encountered by the NX-01 crew in the ENT pilot had the STIII/TNG look. If nothing like any of these scenarios happens, then the sudden “re-imagining” of the Klingon race was, in my book, not only unnecessary but inexcusable. In regards to the more advanced look of the ships and other technology, I can understand and accept a certain amount. For example, if they made the Starfleet ships look just a bit updated — say, something like the old Enterprise 1701 refit or 1701-A — and without the low-budget look of the original series, that would probably be acceptable. Keep the general designs and colors, so that everything is recognizable as belonging to the Prime universe. But, making everything look generations more advanced was a mistake, IMO, even if we’re pretty sure tech would actually look closer to that than to something clearly designed in the 1960s. Similarly, it was a mistake to introduce cloaking technology and hologram communications at a time far earlier than they were introduced in established canon. (I talked about this more in my review of the pilot episodes.) These technologies aren’t limited to just one, experimental ship (see below), since we’ve seen multiple Klingon vessels now use the cloak and both Klingons and Starfleet using the holograms, rather than the (mostly) flatscreen viewers that were standard in all previous ST series. It might be possible to write out further use of cloaking technology (for a few years, anyway), but I don’t think that is feasible with regards to the holograms. If the new series’ creators were so set on using “new” tech, they probably should have set the show further in the future. As for the paradox of the spore-drive’s existence, I think there is still time to resolve it — if not in Season 2, then in a later one. As has been pointed out elsewhere, Discovery is an experimental ship using an experimental drive technology. There is no need to assume that it will get any further than that. When they were still using the giant tardigrade to navigate, I thought they might abandon the spore tech for ethical reasons. (I.e., “we can’t use it if it means having to effectively enslave these creatures.”) Once Stamets realized he could be the navigator, the situation changed. 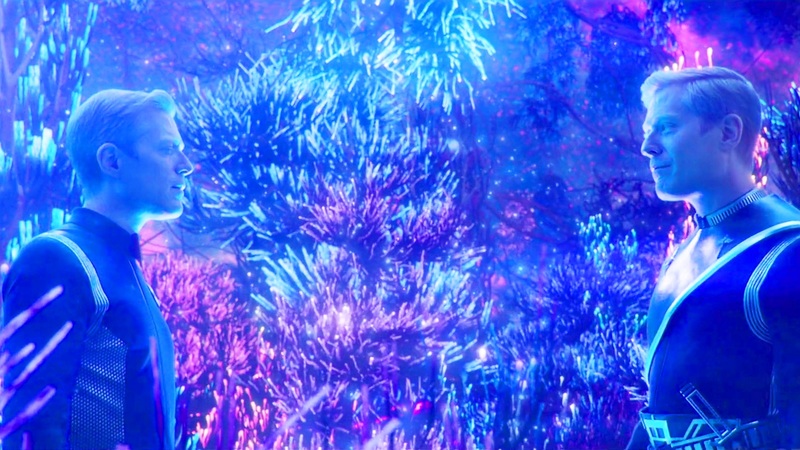 But, it obviously still has its dangers, not only to Stamets (or whoever else might be hooked into it) but there’s the possibility of damaging the mycelial network and unraveling hyperspace (or something like that). I suspect this will tie into whatever decision is made to cancel use of the spore-drive, especially after Burnham’s rousing speech about the Federation needing to stick to its principles. About that speech… The “darker” nature of the season’s story arc and a certain amount of ethical ambiguity expressed by the words and actions of certain high-ranking Starfleet officers were among the turn-offs to many long-time Trek fans. I admit, it bothered me, too. But, it appears that that was all part of the writers’ plan, as the characters were brought to a situation of existential threat that forced them — thanks to Burnham’s actions — to take a hard look at what they stood for and what they were willing to do to “win”. In other words, this was a turning point in Federation and Starfleet history that led to the (hopefully) more consistent, honorable, shining example that we know from other ST series. Of course, as this article reminds us, the people and events of the Star Trek universe — even Federation and Starfleet — have never been flawless or reached the ideals they strive for. Even our heroes are “human”. Ultimately, I think it would have been fraught with many fewer problems — both in terms of canon violations and audience acceptance — if the producers had opted to go with a non-prequel series. Something concurrent with TNG/DS9/VOY might’ve worked, but I think fans (including me) are/were more than ready to boldly go into the 25th century or beyond. (See a few suggestions here.) The war aspect was another negative point for many (though it wasn’t the first time Star Trek did that), and I think longtime fans would prefer a return to focusing on exploration and first-contact situations. Maybe someday we’ll get it. There are those fans and other viewers who have little-to-no respect for the idea of canon and the need to maintain consistency across stories told within a larger framework of people, places, and things. Such people will write me off as perplexing at best, but more probably with some degree of condescension. At the other end of the spectrum are hard-core Trekkies/Trekkers. These are more likely to have, in addition to a healthy respect for established canon, certain parameters of tone and adventure in their mind within with a “real” Star Trek series must operate. I am much more sympathetic to these fans, but I suspect some of them will just shake their heads and wonder how I can call myself a Trekkie/Trekker. But, I have to call it the way I see it. I for one will continue to watch “Star Trek: Discovery”, because, in my assessment and for my particular sensibilities, the positives still outweigh the negatives. It might not feel or look quite like other Star Trek series (would it be wrong to quote IDIC here? ), but it’s still Star Trek, and I’m willing to stick with it — at least, for now. P.S. I realize that there are other aspects of “Star Trek: Discovery” that were inconsistent with established canon, like the use of the familiar delta symbol, which was supposed to be limited to the Constellation-class ships (or, maybe just Enterprise?) until later adopted for all Starfleet. Much as I like James Frain in the Sarek role, there are a few inconsistencies in his character compared with the older version portrayed by Mark Lenard. There’re also all the questions about inserting another sibling for Spock, which somehow never got mentioned in any other series or movies. Etc. But, I didn’t have the time or energy. You can read more about these issues and others here.